The Collio area stretches along the northern side of the province of Gorizia. Its climate is among the mildest in the region: winter is the driest season, in spring there is heavy rainfall, summer is warm and windy and in autumn the climate does not get excessively cool. The nearby sea proves to be the decisive influence for the microclimate. The soils consist of alternating layers of marl and sandstone. "Ponka� is the word in the language of Friuli defining the marl, which easily crumbles into scaly fragments when in contact with atmospheric agents and finally dissolves into the clayey soil. Marls are rich in limestone, potash and phosphor, whereas sandstone is mainly made up of silica and of a smaller quantity of limestone. From a morphological point of view Collio is characterised by gently sloping high ground, which is rarely more than 200 meters high. In order to hold back the corrosion of soil, terraces have been dug out which are known as �ronc� in Friuli. The sandstone soils, which are firmer and have a steeper morphology, are covered in woods. Modern vine growing started in the middle of 19th century thanks to Count La Tour who introduced choice varieties of French and German grapes as a substitution for native grapes of lower quality. The goal of the continuous development in vine-growing is represented by the D.P.R. 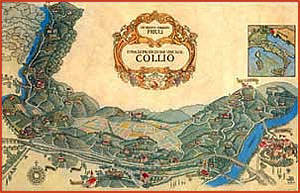 of 24.5.68, which recognised the wines of Collio, among the first in Italy, as being worthy of the DOC certification; on the whole, sixteen varieties of wines (four red and twelve white wines) have to be produced with absolute purity from very high quality grapes which cannot exceed the modest quantity of 110 quintals per hectare.